Hi...Welcome to AYESHA'S KITCHEN. Here am discussing how to make an easy and perfect ghee rice in pressure cooker. 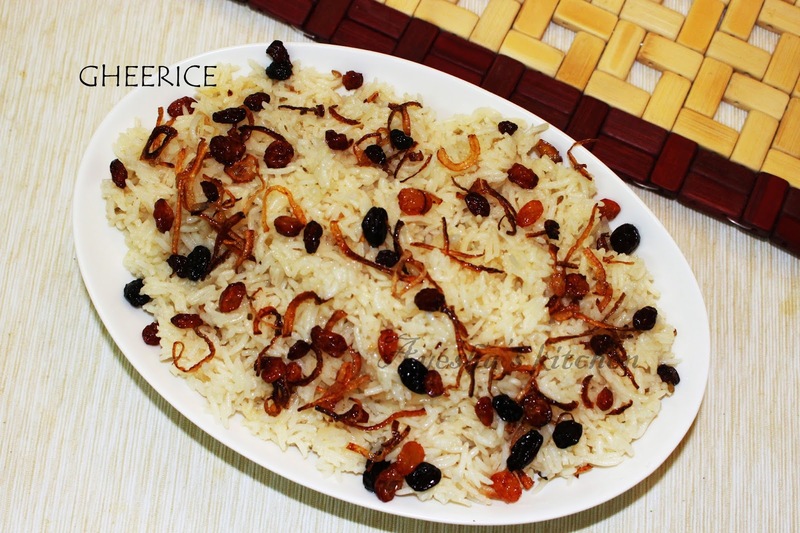 Ghee rice is a very delicious, aromatic and filling rice recipe that makes our tummy yummy. Preparation of ghee rice in the pressure cooker makes this dish very simple and heavenly incomparable tasty meal. More than that, I used most of the spices of biryani in this special rice preparation, that really makes this dish so special. 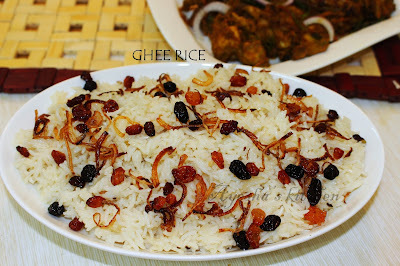 Here is recipe showing how to make perfect pressure cooker ghee rice / Neychoru. One of my best and favorite rice recipes!! Firstly, clean the rice well and soak the basmati rice in water for 15 minutes. This makes the rice soft. When done, drain the rice and set aside. Now, let's start making ghee rice. Saute cardamom, cloves, cinnamon stick, fennel seed. Saute for a while. (you can add more ghee/oil if required. I prefer adding oil now). Then add the sliced onion and saute until the onion turns transparent. Then add ginger-garlic paste and chopped carrot. When the raw smell goes off, add the rice to it and mix well. Close the lid of the cooker and allow it to cook for two whistles ( for best result, off the flame before the second whistle starts but never off the flame immediately after the first whistle). Then open the lid and let it cool down for 5 minutes and mix well with 3 tbsp of ghee. Never mix immediately to avoid mushy of rice and adding ghee finally, makes the ghee rice very special in flavor and texture.